Hello lovely hCGers. 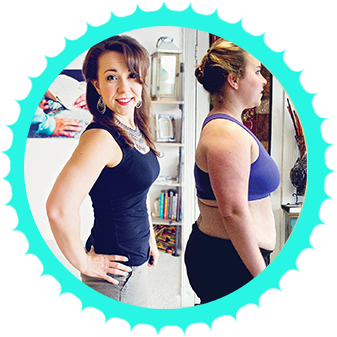 This interview is part of what is now a plethora of weight loss success stories with real everyday women (and men! There’s a few dude interviews in there) who have used either hCG injections or drops with the hCG diet protocol to lose between 20 and 150 lbs. You can see the current episodes available here. I highly recommend you listen or watch the interview to get the full story, because we talk about quite a few details that I just can’t include in the written version of the story here. hCGChica’s Phase 3 to Life Program – you can enroll anytime, but I recommend at least a week BEFORE P3 starts if at all possible so you have time to familiarize yourself with the program and plan ahead. Exercise on hCG – Alexandra tried exercising on one round and she found out it’s not okay for her body. hCGChica’s Dosage Article – Alexandra is on a high dose of 250 iu and she felt fine with that. HaloTop – Ice cream sweetened with stevia and erythritol. This is suitable for phase 4 ONLY as it has BOTH erythritol and regular sugar combined for sweetness- just less sugar than regular ice-cream. It is a LOW-sugar, not NO-sugar product. The main ingredient is a milk protein, so if you are dairy sensitive like me and it’s particularly to the milk PROTEIN, not the milk sugar like Lactose, this may not be a good choice for you. There are currently 24 flavors, WHAT!!! Man I wish I could eat small amounts of sugar and milk protein right now. Some of you are REALLY lucky. That’s okay. The P3toLife dessert ice-cream smoothies in my P3 program are PRETTY to die for too and I can have those every stinkin’ day, no sugar. Cheaper too I’m sure. How much actual sugar is in this pint? For the whole pint of Birthday Cake flavor, it has 24g of “sugar” (not carbs which contains the fiber and sugar alcohols and such that we are not concerned with). There are 4g of carbs in 1 teaspoon of sugar, so each pint if you eat the whole thing, which, who are we kidding, that’s TOTALLY what we are going to do, has 6 teaspoons of actual sugar in it. This is indeed less than a pint of Ben and Jerry’s Chocolate chip cookie ice-cream which has 100g of sugar – WOA. So that is 25 teaspoons of sugar in 1 pint. 6 teaspoons of sugar vs. 25. 24g of sugar vs. 100g of sugar. Okay, I get it. That’s definitely a lot less, and for someone who is not a sugar-addict like me, this could be a GREAT choice for a low sugar dessert. She has a condition called stress-induced narcolepsy where she just fell asleep when she’s stressed. Basics: (age, height, menopause? any medical details you feel are important- ie thyroid etc). Right now I am 24. When I started this journey, it was right when I hit 20. I felt like I needed a change, you know? I am 5’1 and a half, the “half” is important, and something that I struggled with is Stress-induced Narcolepsy, so anytime my heart rate and stress levels gets above a certain level, I actually fall asleep. So, I was always like, really hesitant, to work out and stuff because I don’t want to pass out in the middle of a gym sesh. So, if I get really, really scared or get really, really stressed, I just pass out. It’s weird. How much weight you’ve lost with hCG/starting weight/ending weight/ clothing size change. How many rounds did you do, how long was each round? stuff like that. So, I went through a really, really tough time. Actually, like ended an engagement and everything, and kind of let myself eat my emotions, really. I got to a point where I wasn’t even getting on the scale anymore because I was so scared to see the number. But I turned 20 and I saw, you know, all my friends and sorority sisters having so much fun and being so carefree, and I couldn’t do the same because I was so self-conscious. So, I realized I needed to make a change for me to improve my quality of life. I don’t exactly know what my starting weight was, I just know that I stopped weighing myself after I hit over 200 lbs. And I had a handmade clothes, so I even took the extreme of going to like, an artist colony, where they made their own clothes, so I wouldn’t have to look at sizes. But right now I’m 145 lbs and a size 4. Tell us how you came to be overweight and your struggles with that? When I was a kid, I was super chubby, like super chubby, and then I slimmed down kind of as I reached the end of high school, and then, you know, gained all of it back; but what I did during that time is I would go with my mom to weight watch meetings, I’d go with my mom to Jenny Craig meetings and get all the food and all that. I tried all of the that diets with her, trying to get to somewhere that felt healthy, and I would lose weight and then I’d gain it all back and more, right? And I realized that the quick fix stuff, doing it very quickly, wasn’t working, and for something to change, something else needed to change. So, I figured I’d might as well do something that is very different than anything I had done before, to get a different result. What type of hCG did you use? If injections or prescription drops, what dose worked best for you? So, my mom grew up in Mexico City, and apparently that is their solution, you know? For anytime somebody gains a little weight, you go to the doctor, you get your injections, you’re good to go. You know, I didn’t change my dosage. I’m going to be honest, I haven’t done much experimentation. I just kind of did the standard one. This is going to sound really lame, but it would go to the 25 mark on the needle. I mixed the hcg myself. I mixed 5000iu hCG with 5ml bac water. So that’s 250iu. There was only a one round where I kind of played around with dosing a little bit, but it was because I was also exercising during it. I found out that didn’t work for me. What would you say your experience was the first week on phase 2? Easy or hard? explain. Could also discuss how you loaded if you like. What parts of the protocol were easier for you and which parts were more challenging? How did you handle the challenging aspects? But the most recent one, I kind of looked at your philosophy of clean loading, actually, and sort of looking more into what that translated into, as far like meals and weight gain, and just where you end up. So I tried that, and I didn’t gain as much weight. I gained about a pound and a half. It made the first days so much easier to do clean loading. Because those first few days, just the starch difference, I felt like I was like, grounded. And of course, there is leftovers, I would just like, watch my friends or my family like, eat the leftovers just so upset with life. The second round–not the second round, the fourth round–the second loading type, it was a completely different experience because the leftovers were still, you know, somewhat healthy compared to the alternative. So, I wasn’t as like, you know, antsy about it, I guess. I actually enjoyed the transition rather than like, resenting it. because I would notice that in a week and a half coming, up to my loading days, I would like, just eat that entire time because I knew like, there was permission to do that. So, with hCG, I always am a lot more productive and a lot more happier of a person, right? Because I can get so many things done, and I never run out of energy (Rayzel’s note: not everyone feels like this on hCG and it can even very from round to round with the same individual – I myself felt GREAT on some rounds like she described, and then a couple of my rounds I felt really tired and had to lay super low. So don’t think something is gravely amiss if you are on Phase 2 right now and feeling tired!). So, it made me crave working out; but when I think of working out, what I think of is like, lifting and lifting heavy, not like a casual walk on the treadmill. So I would go on the gym and try to lift heavy and then be starving afterwards, because my body craved protein to recover, and then I didn’t know how to supplement it, and I hadn’t done enough research to really know how to approach that, really, so I decided it is probably not the best time to do this. I can wait, you know, three more weeks and then do it afterwards. Rayzel note: See my series about hCG and Exercise and how to figure out if/how you can do it on hCG or not. What did you find yourself liking to eat during Phase 2/vlcd – how would you prepare your meals? I did the traditional 500 calorie. What I did–and this is actually something that I didn’t think of much–the first three rounds that I did, I kept starchy veggies in there- like green beans, for example. Because I found these microwavable ones that were so easy, and they didn’t impact my weight loss, I didn’t even think twice. it was totally fine, there was no plateaus, there were no blocks. Even, you know, the plateau that you get about halfway through, didn’t even happen. I was so elated. And then the most recent round I was like “What am I doing wrong?” I kept like hitting these plateaus and struggling. I couldn’t figure out what was wrong and then I realized the minute that I switched off the green beans all of a sudden– all of my issues went away. So, it may have been that we’re like, hitting where I need to be, like more consistent, you know? Or really sticking to the protocol more, but it was very interesting. Rayzel note: It does seem like when you get leaner, you can’t always get away with some modifications to the hCG protocol. So if something was working in prior rounds that was “rogue” but you are getting tinier and struggling, try going back to basics. What Lessons have you learned during Phase 3 – give us the good and the bad! What types of things did you discover when it came to maintenance that did and didn’t work? Rayzel note: Also see the excerpt from our interview where she talks about utilizing my P3tolife Program! So, the first three times–yeah, it was kind of a crap shoot. I didn’t realize you had to ramp up, I didn’t do my research very well. So, you know, with calories you have to do 700 and then 900, to an extent, until you get back up to a good range. It was so rocky. I would look at the scale and be like, “What did I change that could have caused this number to go up? How do I get it back down?” And so, it was a lot of second guessing myself, and trial and error until, I finally found a place where I found homeostasis. This last time, well, I made it more plant-based, and that helped. So, for example, instead of using like, regular milk, like cow’s milk, I would use cashew milk. Instead of eating a ton of meat, I would use like, pea protein or different things like that. So, everything that I ate was very plant-based. And very well-measured for the first time. Rayzel note: I love that she documented this and is telling the honest story- we ALL fall off the bandwagon. We all make mistakes and ask ourselves, why did I screw that up? Everything was going so well. It doesn’t matter if you’ve done the same- you can turn this thing around with the right timing and a strategy. In Phase 4: Can you tell us what types of foods you eat now in everyday life? And how is this different from what you used to eat on a normal basis? What have been your tools for maintaining your weight loss? And now, I look first at as an expression of self-love. Which sounds like super easy but it’s like an expression of self-love. If I was making a meal for somebody else, what would I want to do to nourish them? And just as we are selfless bred of people, I want to be selfish for myself. So, that’s my mentality when I start prepping meals is, “What is the best love that I can give myself and my body?” whether if it’s plant-based or has a little meat in there. It took a lot of introspection because you can read anything about diets. And there’s all these articles. All you have to do is do a google search and you’ll be inundated but you need to look at yourself and what works for you personally. It’s going to be different for everybody. Do you have any memories of your life/body pre hCG that are totally different for you now? I’ve always kind of eaten for emotion. I was a little bit weird as a kid, you know, the kid that didn’t really talk to anyone, just like, sat in the corner and read, and that kid is easy to pick on. So, instead of like confronting people or, you know, dealing with it or talking about it (which I was encouraged to do), I just ate about it for awhile. And, that just made it worse. It became this vicious cycle until, yeah, something needed to change. it’s to the point that some of my sorority sisters even like, I’ll see them now and they don’t recognize who I am. When you want a treat now, give us a couple examples of what you might eat? Also, are you ever able to indulge in a regular treat, like cake at a party, and still maintain? I’m madly in love with Halo Top because my thing was ice cream. Like, even how I would study for finals before, starting to get healthy, I would get my pint of ice cream and my energy drink and that’s how I would study. It was awful practice. There are 12 flavors and my favorite is Lemon Cake. It’s 240 calories a pint for my lemon cake one. I served this to my fiancé and he didn’t know the difference. That was the real test. He didn’t know it wasn’t real ice cream. And he won’t eat anything “diet”. What do you feel are the most important keys to success on the hcg protocol? If someone said they want to have the same results you have, what would you tell them? I would say make it fun for yourself rather than making it like, “Oh, I have to eat this.” or “I have to do this for this amount of time.” Make it fun for yourself somehow. So, I would invite my fiancé – who was then my boyfriend – and we would cook together all my meals for the next week of the very low-calorie diet. So, we’d be sitting there like chopping veggies and just having a great time, right? So if you want to like bring your friends into it – but make it fun somehow. I know a friend of mine that got started on it after seeing my transformation. She started incorporating like family recipes but modifying them to meet the low-calorie protocol. So, like Ceviche for example, taking the fish and the lime juice and then all the little veggies. Just make it FUN. Alex: And kind of more recently, ever since actually you released your “P3 To Life” program – that’s what I’ve been using. Rayzel: Oh, really? Oh my gosh! I didn’t even know you had it. You little sneaker – like, hiding things from me, you know? Now, that program, you must be kind of adapting it a little because that’s actually more of a high meat protein program but you can still probably work with it (rayzel note: she had transitioned to a more plant-based diet at this point). So, how are you utilizing it? I’m curious about that. Rayzel: Right. Because you’re in maintenance too – right. Alex: Yeah. So your Chia Pudding for example – like I’ll add an extra protein scoop or you know, just little things. I got to say my favorite is the Pad Thai though. Alex: Miracle noodles are the best. Rayzel: Awesome! It makes it like a nice big meal, you know? Alex: It does. I think that’s what I liked most about your program – is that I feel like I’m eating so much but it’s so super healthy. Rayzel: I’m so glad to hear that. That’s great. And that’s nice to hear coming from you too since you’re in early Phase 4. And like you said, you’re adjusting it a little bit but just that the portion sizes are generous then. Alex: Oh, absolutely. It’s more than I would’ve made for myself like volume-wise. But then, you look at like the stats behind it – like the calories and macros – and it’s awesome you know? Rayzel: Yeah. And the perks on the pudding right? So, like when you wake up and you weigh yourself, things are okay. Alex: Yeah, absolutely. And it’s taken the thinking out of it and I still get to eat awesome food right? Like that cream of mushroom that’s with coconut milk? Alex: Awesome. You would never be able to tell. And then, I get a ton of broccoli with it so it’s just very filling, very good. Rayzel: Good. Oh, thank you so much. Well, that was totally an unexpected testimonial. Thank you. That’s so fantastic. That’s great. And I liked that you talked about the comparison to past P3s too because that’s kind of what made me realize that it was needed. Rayzel: It’s because I was like you. Like, it was rocky. I did maintain in the end but it was rocky. It was so much guest work. It was really stressful. Half of P3 you spend the whole day being like, “Okay, I need to … today.” or “Why isn’t it going so well? It’s going up. Let me try to figure out why and what I should eat today.” you know? Alex: Yeah. It’s like, in this transition period, if I run around the block, will it hurt or help? Alex: Yeah. No, that’s true. In the first couple rounds, the first thing I would go to is cheese. Like, I’d do the exact protocol and then add the calorie worth in cheese. That’s probably not the best way. Rayzel: Right. Because it’s low-carb. Alex: Probably not the best way to go about it. Rayzel: Yeah. But that’s the thing, you know? None of us can be blamed. Like, we’ve been through the low-carb revolution and we’re like, “Hey, I can have a jar of cashews and I’m good because it’s low-carb or the cheese.” and then, once I started like actually planning the program and like getting into macros. Like, “Wow. This tiny little bit of nuts has 250 calories.” You know? When you’re trying to gradually introduce in P3 and you ate just a thousand calories of almonds. I mean, you would not be content. Alex: No. And that’s something that I thought was brilliant from your program too – was the nutritional yeast? I’ve never heard of it before your program. Alex: So to make it taste like cheese but then not have the calorie count.